An engine that runs too hot does not last long. While your engine’s cooling system is responsible for regulating operating temperature, your exhaust system also plays a major role. Much of the heat energy of the combustion process is unusable and must be disposed of quickly. That is the job of all the piping and ducting that runs from the motor to the back bumper. Hot air and vapors are cleaned, cooled, and passed safely out of the rear pipe. Old worn out pipes with leaks and restrictions need to be replaced. We specialize in muffler repairs and can install custom exhaust systems that will hwlp keep your engine running at its best. Contact our Meineke #2042 in Franklin, NC, for an evaluation. The more you drive your car in Franklin, NC, your car muffler undergoes quite a bit of use and it needs to be kept in proper shape. If you notice a decrease in your fuel economy, a foul odor from underneath the vehicle or your car seems to be running louder, you should have your muffler checked. Depending upon the severity of the issue, you may be able to just pay for muffler repairs rather than a replacement. If you notice that your muffler is hanging low under the car, it should be addressed immediately. For a detailed diagnosis, contact a technician at Meineke #2042 today. Corrosion is one of the biggest problems facing your exhaust system. When moisture sits in the system, it can react with the metals of the pipes and cause them to rust. Over time, this rusting can cause breaks to form in the pipes which will leak gases and affect the performance of your vehicle. If you drive more than 15 miles at a time on a regular basis, you may consider equipping your vehicle with the stainless steel pipes that are part of a high performance exhaust system instead of those made with traditional steel, to eliminate the problem. Contact Meineke #2042 in Franklin, NC, for information on pricing. Exhaust systems do eventually wear out. The combustion process inside of your engine creates a tremendous amount of heat. This forces chemical changes to occur. While much of your fuel is burned up, one of the remaining byproducts is water vapor. This vapor comes into contact with the metals causing oxidation and rust. Eventually the metals of your manifold, pipes, and car muffler wear out. They develop cracks and weak spots. You may hear loud engine noises or notice an odor as you drive. Fixing the problem may require an aftermarket exhaust or even a custom exhaust system to be installed. If you are experiencing any of these warning signs, contact our in Franklin NC, and have your vehicle inspected. 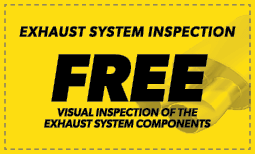 If you want the best performance exhaust system possible for your vehicle, don’t look any further than Meineke #2042. We carry many kinds of performance exhaust systems for cars, no matter what their make or model is. Our technicians are committed to providing you with the most expeditious and affordable aftermarket exhaust services possible. Whether you are upgrading to a high performance exhaust or getting some muffler repairs done, we’ll do everything possible to keep your muffler repair cost low. Stop by one of our many convenient locations in Franklin, NC.